Paolini, C. (2008). Brisingr. New York, NY: Alfred A. Knopf. How much can a simple farm boy achieve? 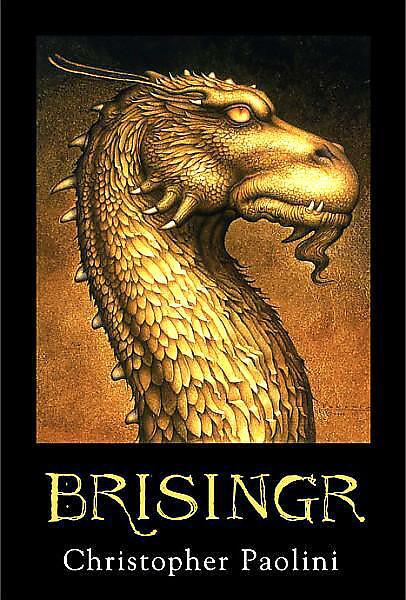 Brisingr is the third book in Christopher Paolini’s Inheritance Cycle. It begins after the stories of Eragon and Eldest, tales of a young man, Eragon, and his dragon, Saphira. This story starts days after the end of Eldest where Eragon, the Dragon Rider, Saphira, his dragon, and Ronan, his cousin, travel to Helgrind, where they defeat one of the evil creatures in the world of Alagaesia, a Ra’zac. While doing so, they rescue Katarina, Ronan’s girl, who is pregnant with Ronan’s child. They return to the rebel Varden, a collection of humans, dwarves, elves, and Urgals, all with the goal of defeating the Empire and Galbatorix, its Dragon-Rider king. Just before the wedding of Ronan and Katarina, the Empire, with Murtagh, and his dragon, Thorn, attack the Varden; Eragon and Saphira defeat Murtagh and Thorn and forces, with the assistance of the Elven spell-casters. Eragon’s journeys then take him to the Beor Mountains, home of the dwarves, and he participates in the election of Orik to be king of the dwarves. From there, Eragon and Saphira return to the home of the elves, Ellesmera, to continue their training. It’s here where Eragon finds out that his mentor early on was actually his father, Brom. He also discovers that Galbatorix has been collecting the Eldunari, the heart of hearts of dragons. As holder of the Eldunari, Galbatorix holds control over the energy and power of those hearts, even if the dragon is deceased. Before leaving Ellesmera, Eragon is given the sword Brisingr, made by the master of swords, Rhunon, who had, before making this sword, declared she would never make a sword again. What she does do is guide Eragon into making the sword, using brightsteel forged by the fire from Saphira. He names the sword Birisngr, and when he states the name, the blade develops a blue flame. In the meantime, Ronan is given a variety of military tasks, and develops into a leader in the military for the Varden. During one battle, the commander loses his hand and a new commander is chosen. During a battle for a village, the new commander, Captain Edric, Ronan went against the commander’s orders, and in killing 193 enemies, he saves the day. Ronan is punished with fifty lashes for disobeying orders, but then made a commander. Later, Ronan fights an Urgal, Yarbog, and defeats him, establishing himself as leader of not just the humans in the Varden army, but given the same respect as leader by the Urgals. As the story concludes, there is a battle at the city of Feinster, where Eragon rescues the elven princess Arya. There, they battle three magicians trying to create a Shade, a creature of evil and death. The magicians are killed and Arya with Eragon’s help destroys the Shade. In the meantime, Galbatorix has Murtogh kill the Dragonrider Oromis and his dragon, Glaedr. They were the ones that had trained Eragon in Ellesmera. The story ends here, which much more to tell and the reader desiring to know and concludes in the the fourth and final book of the series, Inheritance. Eragon, the Dragon Rider, is part human and part elf, and rides the dragon, Saphira. Eragon is the symbol of all good in Brisingr; trained by elves, a part of the dwarf family of Orik the king of the dwarves. He is a leader in the rebel Varden, and the story revolves around his journey. Saphira, the blue dragon of Eragon, communicates with him telepathically, and is one of only four dragons known to be alive at this time. Arya is the Elven warrior/princess who travels with Eragon on his many adventures during the story. She is one of his biggest supporters, and looks out after him, and he becomes very close to Arya during this story. Unfortunately a relationship much desired by the readers is not meant to be for Eragon and Arya. Murtugh is another Dragon Rider, but controlled by Galbatorix. Murtugh fights and defeats Eragon in the previous book in the series, but in this book, he and his dragon Thorn are defeated. Murtugh later is guided by Galbatorix and defeats Oromis and his dragon, Glaedr. Galbatorix, the King of the Empire, who has defeated, over the years, all the original Dragon Riders. His power is derived from those that he has defeated and now controls, even in death. Orik, the King of the Dwarves, has taken Eragon as part of his “family”. Ronan, Eragon’s cousin, becomes known as Stronghammer, a commander in the Varden army, and the husband of Katarina. Oromis, the last Elven Dragon Rider, who trains Eragon to become a strong Dragon Rider, and while doing so, Oromis’ dragon, Glaedr, trains Saphira as well. Oromis dies at the hands of Murtugh, who is controlled at that time by Galbatorix. This is an excellent continuation in the ongoing story of Eragon. It was originally intended to be the last book of a trilogy, but the author, Christopher Paolini found that there was still more to tell to bring the story to a conclusion, and thus, Inheritance is the fourth and final book in the Inheritance Cycle. There is a great deal of detail and descriptiveness in this story that draws in and engages the reader from the first words to the last. Anyone that is a fan of The Lord of the Rings trilogy by Tolkien will undoubtedly enjoy Paolini’s world of Alagaesia and the story of Eragon.